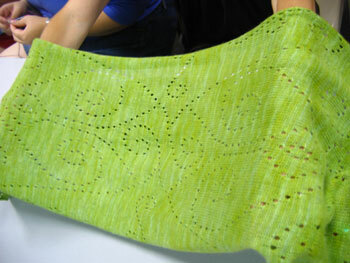 Before she left, we got to see her latest incredible shawl pattern, Basilica. 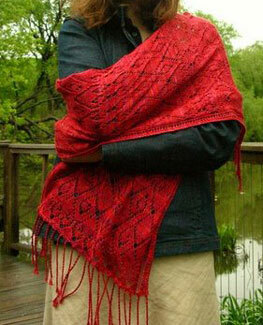 We'll miss you Gbella - and your amazing knits! We haven't seen much of Gabriella recently, but look what she's posted on her blog! 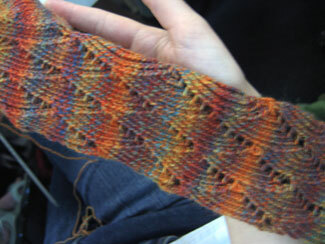 After designing an awesome pair of socks for Knitty, she's designed a beautiful shawl. And you can buy the pattern directly from her blog. 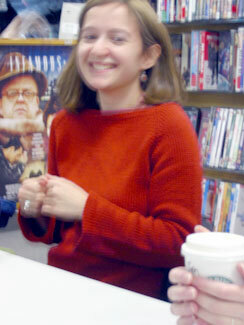 Gabriella wore her fabulous new hourglass sweater (from Last-Minute Knitted Gifts ) this week. 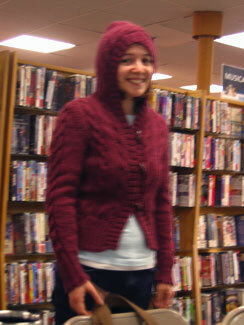 Gabriella wore her finished Central Park Hoodie! Doesn't she just look so cute in it with that hood?! She knit it in Plymouth Galway and didn't even block it - phew. ;0) See some better pics on her blog. 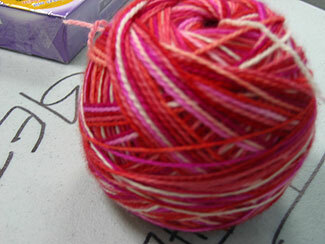 Look at Gabriella's new sock yarn! It's from Yarn Pirate. Please buy some from her, so Gabriella won't be tempted to buy any more! 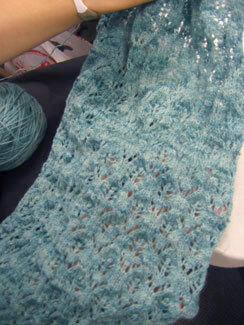 This week Gabriella was working on this gorgeous lace scarf. Gabriella knits the most gorgeous socks! 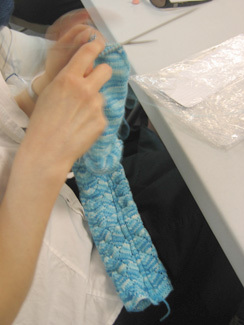 Now she's working on a Pomatamus sock in Trekking XXL. 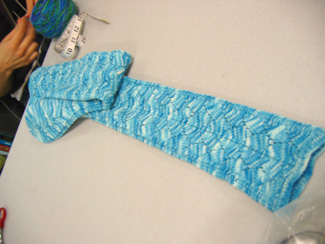 And a few weeks ago she was knitting beautiful lace knee-highs with some of Dani's handpainted yarn.